A message that says it all..."I Love You Mom". Make a keychain or purse charm. Have your child line up beads in order to be strung. You can write the message on a paper and match the letters. Tie a slip knot at one end or tie around a bead to keep others from slipping off. Tie a double knot and put a drop of glue to make extra secure. 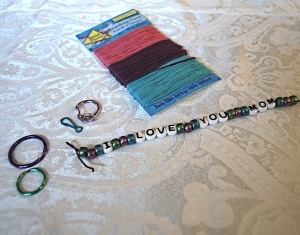 Write your message with extra space between words so you have room to line up beads to be placed between the words. Read the words together and identify each letter. Add charms to the keychain/clip.